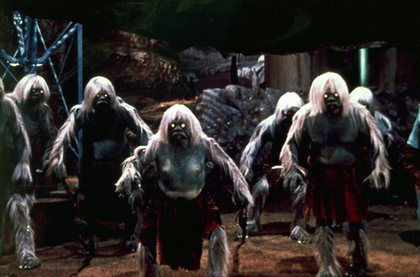 In George Pal's 1960 classic The Time Machine, H.G. Wells (Rod Taylor) invents the titular contraption and travels thousands of years into the future. There, he does not find the Utopian society that he wished for, but a sharply divided "human race," which has evolved into, on the one hand, vicious, subterranean Morlocks, and, on the other, peaceful, laissez-faire Eloi. Before Wells (known as "George" in the film...that's, apparently, what the "G" stands for...) knows about the Morlocks, though, he interacts only with the Eloi. He finds their life idyllic, if dull. On occasion, though, a great horn sounds, and the Eloi turn into strange automatons, marching mindlessly into caverns in the Earth. We find out later that they are marching into the clutches of the Morlocks, and to their death. Nothing George can do, no shouting, shaking, or pleading, can break the Eloi out of their trance. Christians go into a similar trance when they hear the announcement of the Law. "Love your neighbor." "Give to the poor." "Honor your father and mother." We think to ourselves that these things are right and good, and that we will obey. And so, we begin our march. We think that to march is obedience, and that righteousness and success lie at the end. We cannot be shaken out of this belief. But, like the Eloi, our march leads only to death. St. Paul says that he was once alive apart from the law, but that once "the commandment came, sin sprang to life and I died" (Romans 7:9). The problem is that we can never know when we have loved our neighbors enough, or given enough to the poor, or honored our fathers and mothers enough. The Law, the requirement, the superego, can never be satisfied. Thus, the march can only end in death. George must descend into the lair of the Morlocks to save the Eloi. It's the only way. Paul cried out for a savior from "this body of death" (Rom 7:24) and if the Eloi were capable, they'd do the same. They are in a trance, though, convinced, like us, that the obedient march is the way to salvation. But a savior must come from outside, someone immune to the siren song of the Law. So it is: "For our sake He made him to be sin who knew no sin, so that in him we might become the righteousness of God" (2 Cor. 5:21). The Law leads only to death, but it is only from death that we can be resurrected. by and through Jesus' death for us, to new life.